It's Taxis Vs. Limos In Laid-Back Portland Like several other U.S. cities, Portland, Ore., requires limousines and town cars to charge higher fares than taxicabs. Two town car companies have filed suit against the city, arguing that the two sets of regulations are unconstitutional. With just over a half-million residents, Portland, Ore., is not exactly a major metropolis. In this bike- and mass-transit-friendly city, there are typically more bikes and buses plying the downtown streets than taxis and town cars. So when Mike Porter wanted to drum up business for his town car company, he did what a lot of businesses do: He took out a Groupon ad, offering a discounted fare to or from the airport. "We thought it was a great idea to get our name out there to the metro area," Porter says. "It was a huge success. We got over 600 ... rides based off this one promotion." But Porter also got something he didn't expect — a letter from the city of Portland, "that we were fined over $600,000, because we had broken the rule that we had to charge at least $50 — or 35 percent higher — than what taxis charge," he says. That's because Portland, like Houston and Miami, requires limousines and town cars to charge more for rides than cabs. Porter did not have to pay the fine in the end — he just refunded all of the coupons instead. But he thinks the fare minimum rule is unfair, and, with a Portland-area limo company, has filed a lawsuit in the hope of overturning it. "It's unconstitutional for the city of Portland to say ... that we have to charge the citizen more money because they want to protect one class of business," Porter says. The city of Portland won't comment on the lawsuit. But Red Diamond, a cab driver who's worked in Portland for two decades, says there's a reason for the regulations. Taxis aren't just businesses, he says — they're part of the city's transportation system. "We get drunks off the road, we provide emergency roadside response," Diamond says. "And we are, in many cases, the primary sources of mobility for people who otherwise don't drive themselves." And city regulations ensure that cabs are always available, for all kinds of riders, Diamond says. "They're required by law to operate 24 hours a day, seven days week, 365 days a year, citywide," Diamond says. "Taxis are required ... to maintain 10 percent of their fleet in wheelchair access vehicles. Taxis are also required to service all trips — including short trips — that are otherwise economic washouts for the drivers." But those short trips and late-night shifts come at a cost. 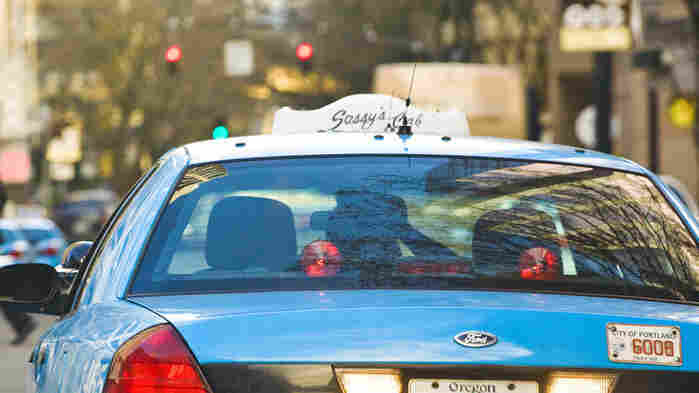 A recent study from Portland's Revenue Bureau found that the city's drivers net well below minimum wage. But the study pointed to other factors that hinder drivers' pay, as well — a glut of drivers, limited permits and high payments back to the drivers' parent companies. Some cab drivers, like David Aguilar, think that restrictions on limos and town cars are not the solution. "If McDonald's decides to sell a hamburger for 75 cents, Burger King cannot go over there and sue them [just] because [Burger King is] selling their hamburger for $2," Aguilar argues. Nor can Burger King tell the city to force McDonald's to sell its burger for a higher price, he says. But cab drivers like Diamond say that the city's minimum fare rules are a necessary part of protecting the taxi industry. And without them, he says, it's harder to serve those low-fare rides to elderly people who go out for groceries or people traveling short distances for medical appointments. "And if the town cars run roughshod over this industry, they take only the airport runs, and they leave us to kind of pick up the bread crumbs, as it were," Diamond says. "That's not a good model for serving the needs of the community." Town car owner Mike Porter disagrees. "This does not protect the citizen at all. This only protects taxicab companies and their profit," he says. "What we're trying to do is just be able to advertise our services at a discounted rate — to be able to show people, 'Hey, you have options other than just taxis.' "
The city of Portland has until July 24 to respond to the complaint.